First in a wok mix grated coconut or khoya with sugar or jiggery and place it over low flame. If making with khoya, add little milk. Now add cardamom in it. Then keep stirring the mixture till it gets sticky. Keep aside to cool. The process will take 15-20 minutes. Now take flour, suji and rice flour in a bowl. And add milk. Mix it carefully not making any lumps. Keep the mixture for half an hour. Then heat the non stick pan. Put a little oil. Pour a thin layer of the mixture on it and spread it quickly with the laddle. Now put the filling lengthwise at the center of it and roll it. Wait till the color is light brown. 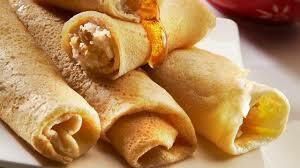 finally serve this Patishapta any decorated plate or bowl.